Amelanchier Canadensis ? 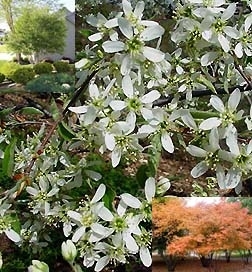 Come home with Bulbsnblooms and go native with our brilliant and easy to grow Serviceberry. It is also known as Juneberry, shadbush, shadblow and May cherry. It can be grown as a multi-stemmed shrub or small tree that grows to 20 to 30 foot tall with a 10 to 15 foot spread. The beautiful flowers are plentiful, fragrant, and grouped in showy white clusters. They flower the earliest of the flowering shrubs and the fall foliage is a brilliant orange-yellow to red. The berries are edible and tasty and ripen in June. They are a good source of iron and copper. Native Americans ate the berries raw or dried them into loaves for later use in soups and stews, or mixed with meat and fat for travel food (pemmican?). Native Americans also used the wood for arrows, spears, and crosspieces for canoes. The juice of the berries was used as a dye. The berries are used today in jams, jellies, and wines. A very adaptable plant, Service berry may be found from southern Alaska south to California and east to Alberta. It is found southward at the east part of its range through the Dakotas, Nebraska, Colorado, New Mexico and Arizona. Planting zones 3 to 7. Use it around areas you want to naturalize, as a screen, or as a specimen tree. It will be sure to spark interest when friends and neighbors come to call.